Los Angeles may be known for being the city of dreams, but I say it’s the city for awesome family vacations! Los Angeles is a great place to visit with kids. 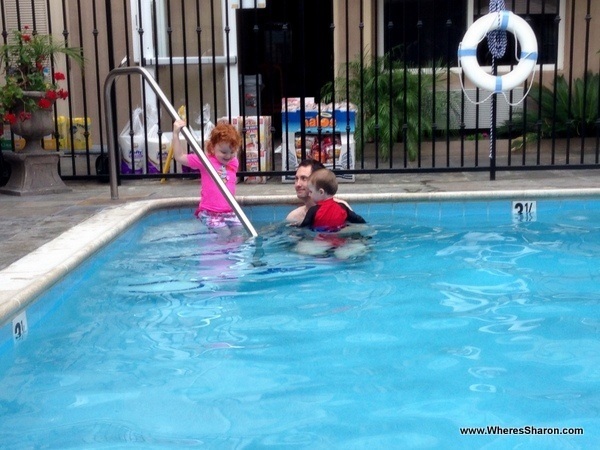 There are many fun things to do in Los Angeles with kids, great food and lots of accommodation. I also find Americans to be some of the friendliest and most helpful people on earth. Combine this with places like Disneyland, Universal Studios, Hollywood and Santa Monica pier and it makes for an easy and fun vacation that your kids will remember. We visited LA with kids twice now. Once when they were 1 and 3 and, more recently, when they were 6, 4 and 7 months old. 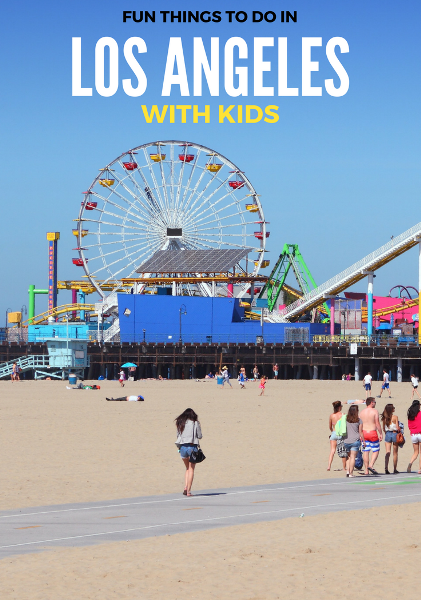 We have had a great time on both occasions and had a fabulous time visiting the best things to do in LA with kids. 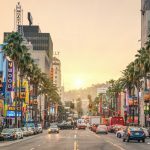 Below you will find our guide to what to do in LA with kids, where to stay in LA with kids, budget tips and other information so you can have a great stay as well! Hollywood is not just a place to go if you want to be a movie star – it’s also one of the fun places for kids in Los Angeles. It’s an iconic destination with a few Los Angeles attractions for families. We enjoyed visiting the walk of fame and looking for stars’ names that we knew. The kids particularly enjoyed the imprints of hands, feet and other objects outside of Grauman’s Chinese Theatre. Another of the kid friendly things to do in LA is visiting the Hollywood sign. This famous sign isn’t just famous for adults. Our kids had no idea what we were talking about on our way to see the Hollywood letters, but as soon as they saw this, they recognised it. 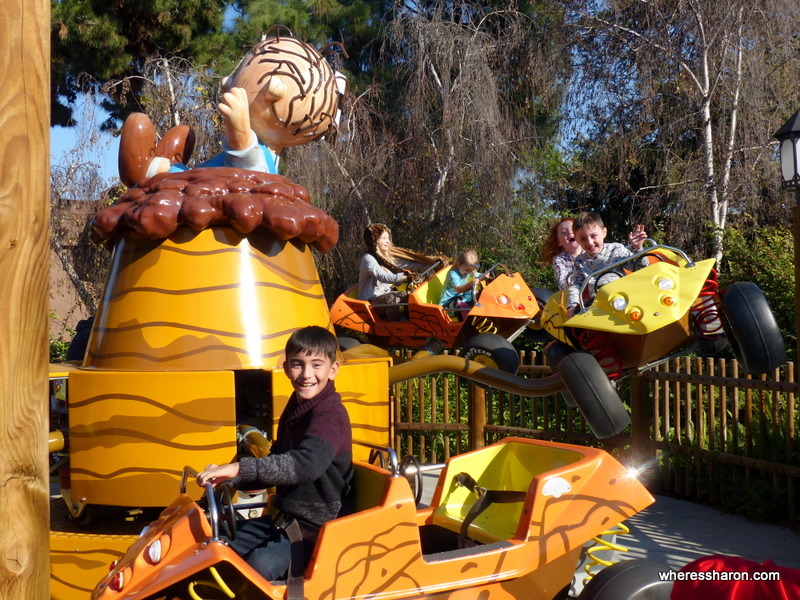 Near the top of the list of fun things to do in LA for kids is definitely Universal Studios. This place is part theme park/part film studio! What I like about Universal Studios is that it has a good mixture of attractions. There are the rides, some literally Fast & Furious, lands best suited for little kids like The Super Silly Fun Land and others attractions more suitable for the parents with The Walking Dead. There are also some great live shows. 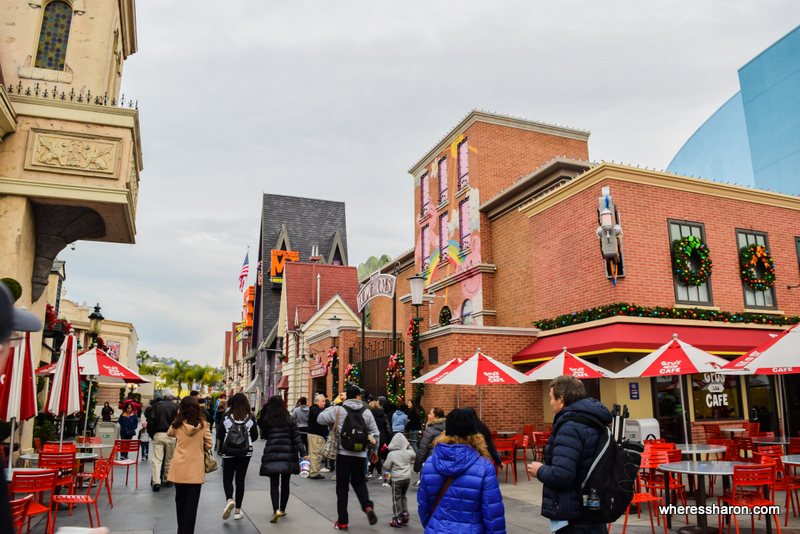 The fact that Universal Studios is a working movie studio helps to make the place unique and a studio tour is a must. It will not interest young kids as much as older kids and adults, but it is fun to see recognisable parts of TV shows and movies like the Psycho house and Wisteria Lane and learn more about how movies are made. 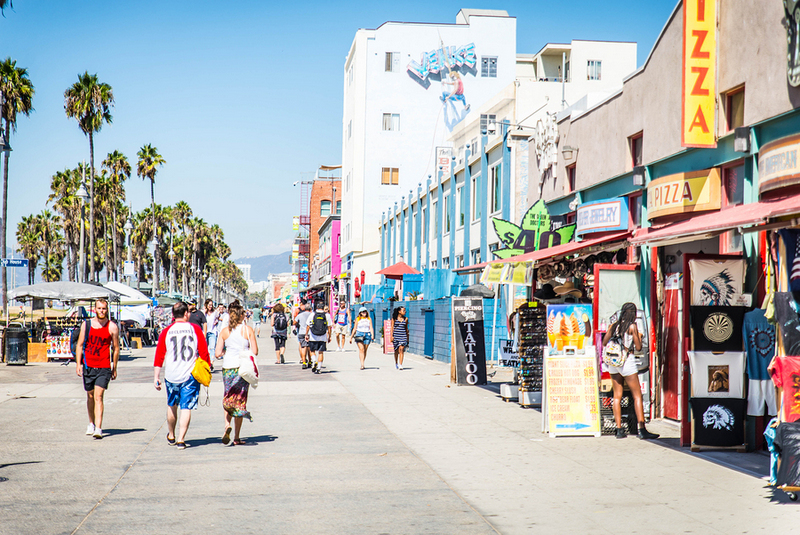 If you are looking for fun things to do in Los Angeles with kids then Venice Beach fits the bill perfectly. It is my favourite spot to people watch in the world! Venice Beach is a lovely wide beach. However, the best part is the path next to it or, more specifically, the people that walk along it. There is such a humorous line up of all types and I love the energy that is in the air. The path itself is lined by stalls, restaurants, bars and shops on one side and grassy areas and activities (like basketball courts, skate parks, etc) on the other side. I think it’s a great option for where to take kids in Los Angeles to have a picnic! There is plenty of food on offer (including a Tasmanian pizza?!) and you can sit on the grass and watch the show parade past. 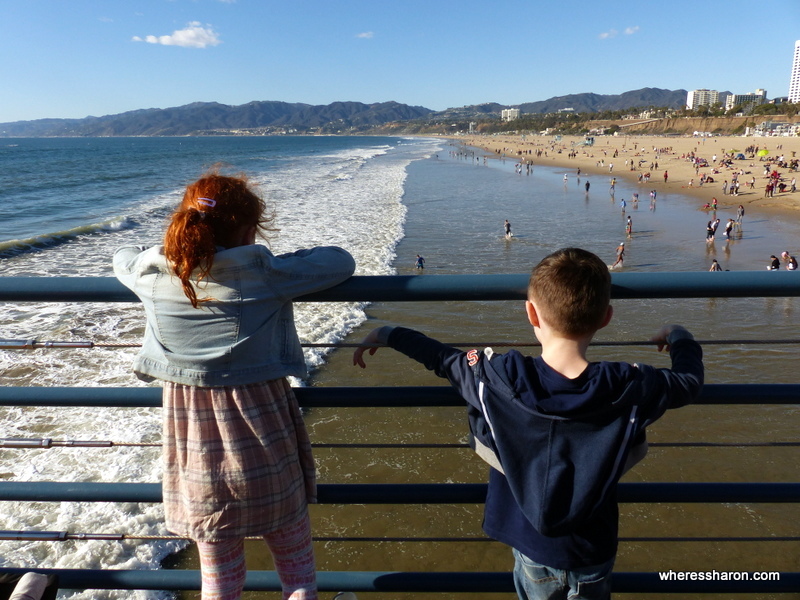 Santa Monica is another of my favourite places to visit in Los Angeles with family. It’s fun and a nice place to hang out. It’s just north of Venice Beach and also has a nice beach. Back from the beach there is also good shopping and many places around to eat. It also has a great energy and is far more polished than Venice Beach. 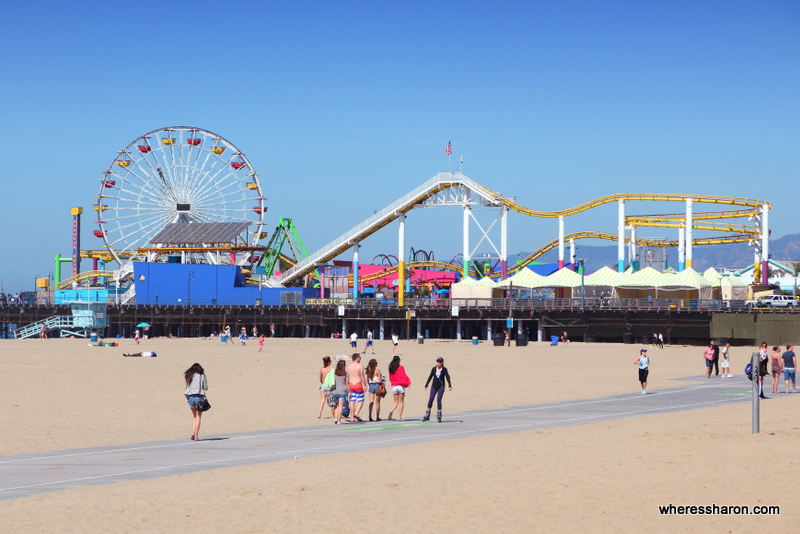 Santa Monica is most famous for its pier – you’ve no doubt seen it on TV. This pier is full of fun things to do in LA with kids. 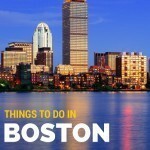 There are rides, arcade games, a small aquarium and places to eat. Our kids had a great time trying out a couple of the rides. They are quite pricey but it’s all part of the experience. The best part of these things to do for kids in Los Angeles is that it just feels like you are in LA. The pier makes for a fun few hours. 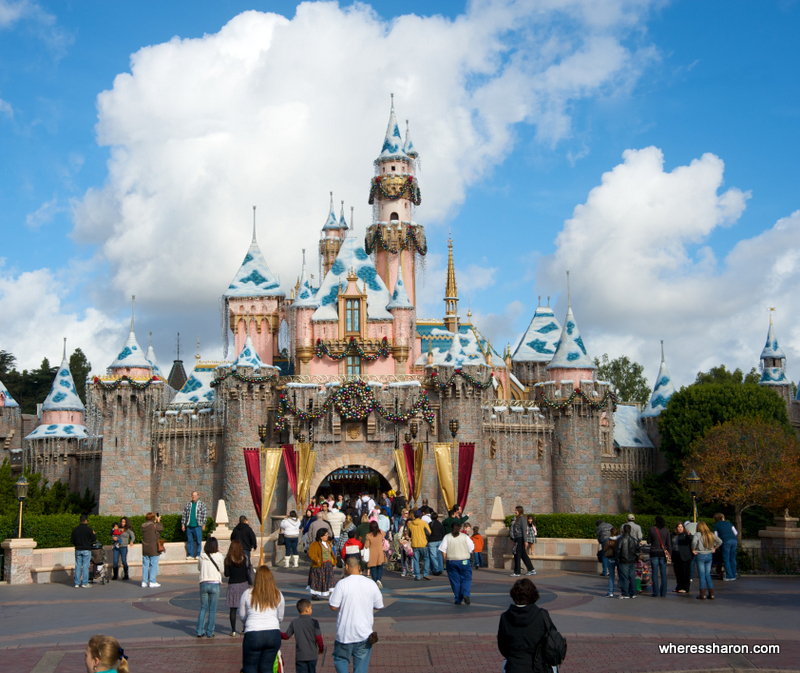 Disneyland may be at the top of your list of things to do with kids in Los Angeles. It’s not called the happiest place on earth for nothing. Disneyland is full of fun family things to do in LA. It’s home to many rides, characters and shows and, of course, the famous Disney parade. I first visited this park on my first overseas trip at 18 and fell in love with it. The attention to detail is awesome and there is a good chance your kids will absolutely love it too. However, it can also be a parenting hell. Disneyland on a busy day is not fun at all. Before visiting, I suggest googling crowd planners for Disneyland (and other theme parks) and trying to pick a day for your visit that will be as less busy as possible. In addition to the Magic Kingdom part of Disneyland, there is also a second theme park, California Adventure, which is also part of Disneyland California and worth visiting. We skipped the main park at Disneyland this visit since we have already visited Disney World in Orlando and Disneyland Paris and we plan to go to Disneyland Hong Kong in a few months. If you have not had these experiences, however, I would highly recommend a visit here on your list of fun things for kids to do in LA. The Natural History Museum is definitely one of the fun things to do with kids in LA. We had a great time here. It’s got a great, well presented collection which is presented beautifully making it very easy to visit here with kids. Our kids are especially interested in dinosaurs so we headed here first. There were many bones of different dinosaurs as well as lots of information particularly around how they find the bones which tied in nicely with La Brea Tar Pits. There’s also much more than dinosaurs of course! We also looked at many mammals from different parts of the globe as well as birds and some items from the history of Los Angeles. Mr 4 particularly loved seeing maps of where each of the animals were from. Kenya featured a lot so now that is on his bucket list! Although I enjoyed this museum, it wasn’t really a stand out for me compared to all the other similar museums I have visited until we went downstairs to the Nature Labs. This is where this attraction particularly deserves its place on the list of fun things to do in Los Angeles for kids. This area is just fabulous. There are many hands on things for kids to do as well as live animals. The kids loved seeing rats living in an absolutely fabulously set out home. They loved seeing a tarantula. They loved learning more about animals that live in an urban environment. It’s a fun space just perfect for kids. Find out more including latest entry prices on their website. 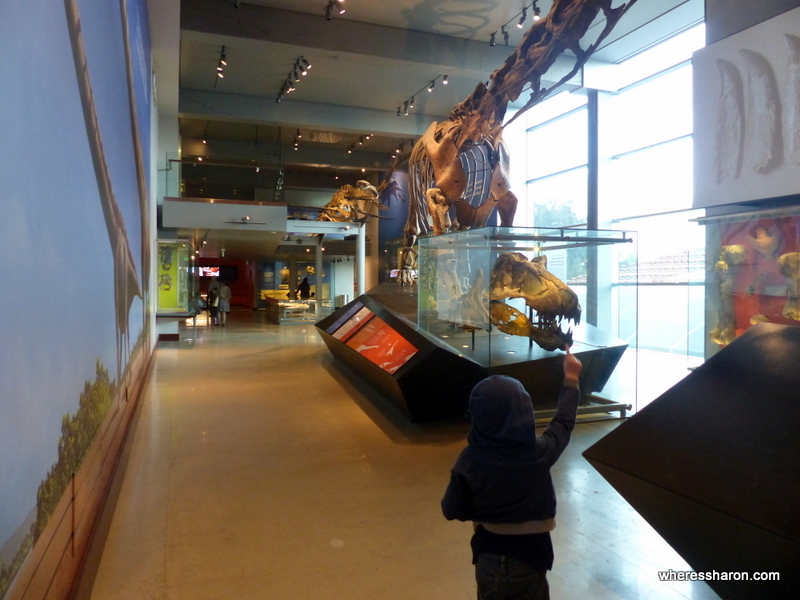 Right next door to the Natural History Museum, the California Science Centre is definitely one of the top things to do in Los Angeles with kids and one of the places we enjoyed the most. This science museum is fantastic, filled with fun things to do in LA with family. 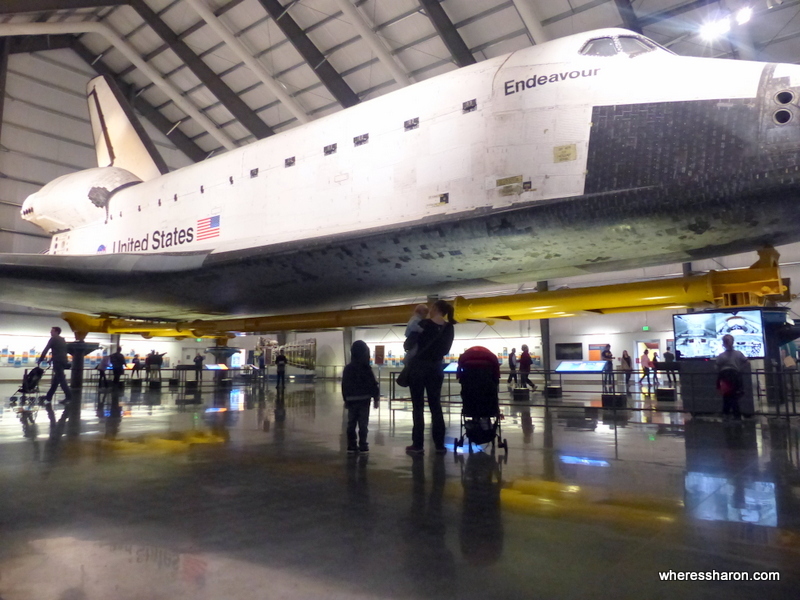 The top attraction here is a huge one – the Space Shuttle Endeavour. You can get up close to this fabulous feat of engineering as well as learning more about life in space and what humans have been able to achieve there. There are also a few different capsules from different missions to see. In some ways I found these more interesting than the Space Shuttle since I could see inside them easily. I don’t know how people spent days in these hurtling down to Earth! There’s much much more to the California Science Center as well. There are some great exhibits from learning more about how bodies work (and witnessing surgery!) to learning about river systems and deserts to a mini aquarium. We particularly enjoyed learning about earthquakes, experiencing what one feels like and constructing some earthquake friendly designs! The kids are very interested in learning more about earthquakes now. We could have spent an entire day here and I loved how hands on it was. What differentiated it from the many other sciences museums we have been to was not just the amazing space exhibits but also the fact that there was an aquarium and live animals in other exhibits as well. There also seemed to be plenty of scientists around to talk and demonstrate things to us. I was very impressed! Amazingly, California Science Center is free! It’s also free to see the Space Shuttle Endeavour but it’s recommend that you get a free ticket with a time slot beforehand on their website. However, no one checked our tickets on our visit which was on a week day in low season. 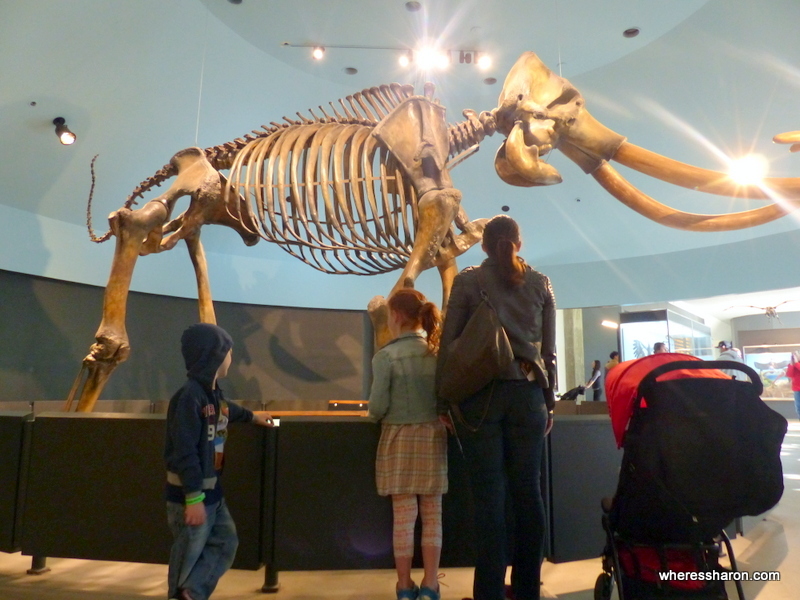 La Brea Tar Pits is one of our favourite choices of the fun things for kids to do in Los Angeles. It’s incredibly educational and our kids found it fascinating (as did us adults!). La Brea Tar Pits are a group of tar pits in the middle of LA. They have been here for about 50,000 years, trapping animals throughout this time. This means that there are many amazing discoveries made in the pools of tar and under the ground. The site today consists of a collection of tar pits, a museum, cinema and excavations. It’s quite amazing to see first hand how the paleontologists excavate the tar pits and look for fossils. The museum itself talks about what’s going on at the site and shows many of the animals found. Most of these are in reconstructions with the found bones, but there are also some moving models. Outside are various signposted tar pits and it’s a nice (but smelly, thanks to the tar!) site to walk around. You need a ticket for the museum, but you could walk around the grounds for free. However, visiting the museum first gave us a good chance to get a better understanding of the site, particularly the animals found there. What I loved about this one of the things to do for kids in LA is that it was quite specific and an easy concept for the kids to understand so they learned a lot compared to the Natural History Museum above. They seemed to understand what was going on at the site and why that was possible. La Brea Tar Pits is also right next door to the Los Angeles Country Museum of Art so you could pair it with a trip here. They had a super fun outdoor installation while we were here that the kids loved but we didn’t check inside. 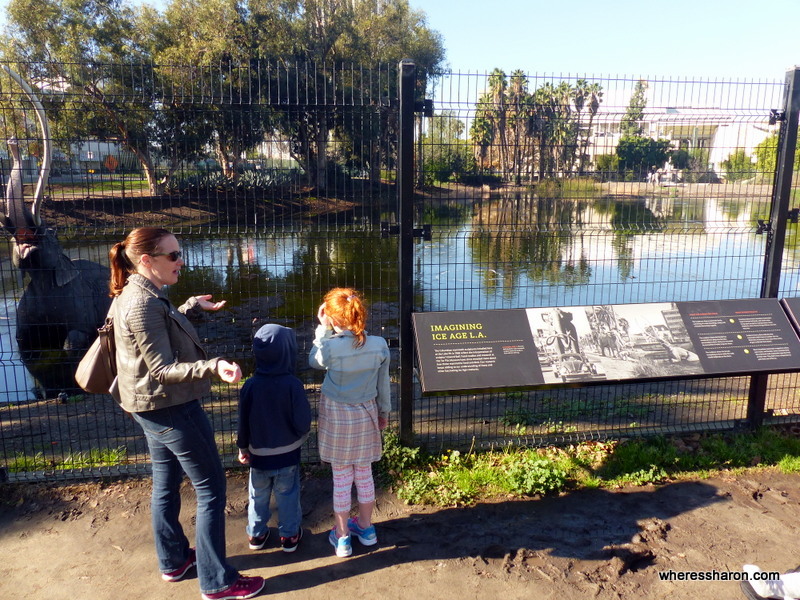 You can find more information on the La Brea Tar Pits here. If you are researching things to do with family in Los Angeles then you have no doubt already come across this huge attraction down near Disneyland. It’s a big theme park, packed full of rides and I have wanted to come here for at least the last twenty years! It was good to finally make it. 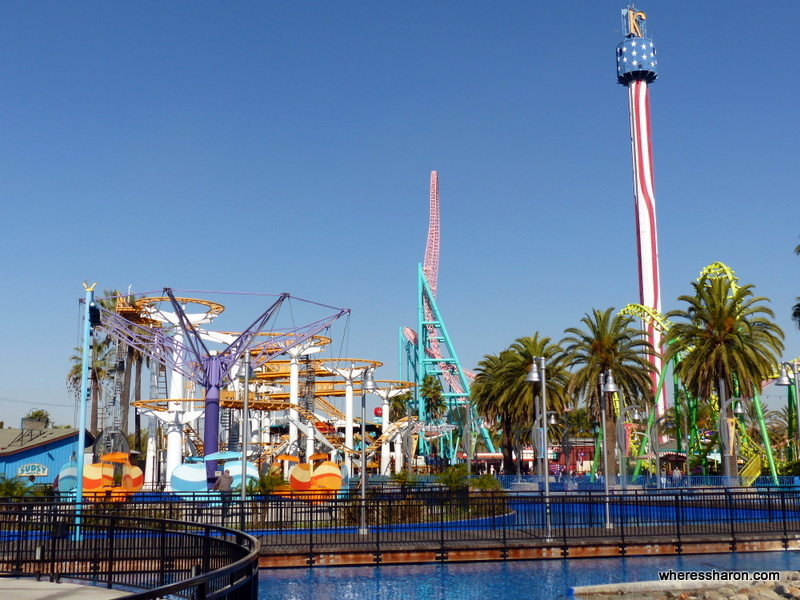 Knotts Berry Farm is definitely one of the most fun places to go in Los Angeles for kids (and adults). There are a few different lands, such as Ghost Town and Camp Snoopy. The park is very well presented and there are scattered shops, eating establishments and a ton of rides. There are also shows at various times of the day. There are many different types of rides with something for every age group. The first thing we noticed was all the roller coasters. There are many including some that look utterly terrifying. Even the ones that are more family friendly are quite fast and had my heart beating very fast! I wish I had made it here twenty years ago as I would have absolutely loved them all. Camp Snoopy is particularly a younger kid friendly things to do in Los Angeles. It’s full of rides for younger kids (as well as a still thrilling roller coaster). There are also Snoopy live shows and the chance to meet Snoopy, Charlie Brown and his friends. There are some fabulous rides. We all particularly enjoyed the Voyage to the Iron Reef which is a 4D ride where it seems like evil creatures are about to take you out at any moment unless you shoot them. It’s one of my favourite rides ever. We also particularly enjoyed the stunt show. We visited on a week day in January and it was superb. There were no crowds at all and we didn’t wait long for anything. Most rides were open and we found this to be a great time to visit. There are many height restrictions. S was able to do any of the rides that she wanted to do as a VERY tall 6 year old. Z missed out on many as a nearly 5 year old including a couple that made him upset that he wasn’t able to do them. There was plenty for them still though so it wasn’t that much of a problem. Find more information on their website. Parking is a whopping $18. 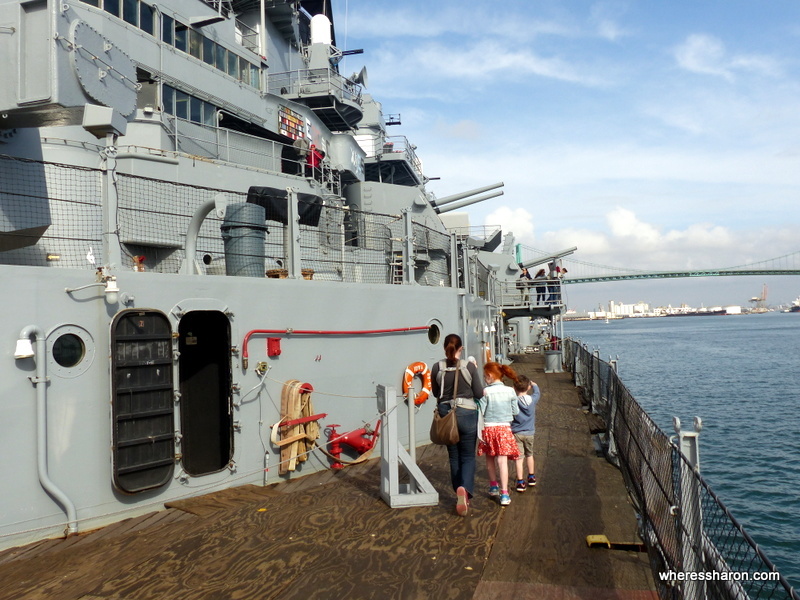 It may not be something that you immediately think of when wondering what to do in Los Angeles with kids but visiting the Battleship USS Iowa is great choice of what to do with family in Los Angeles. 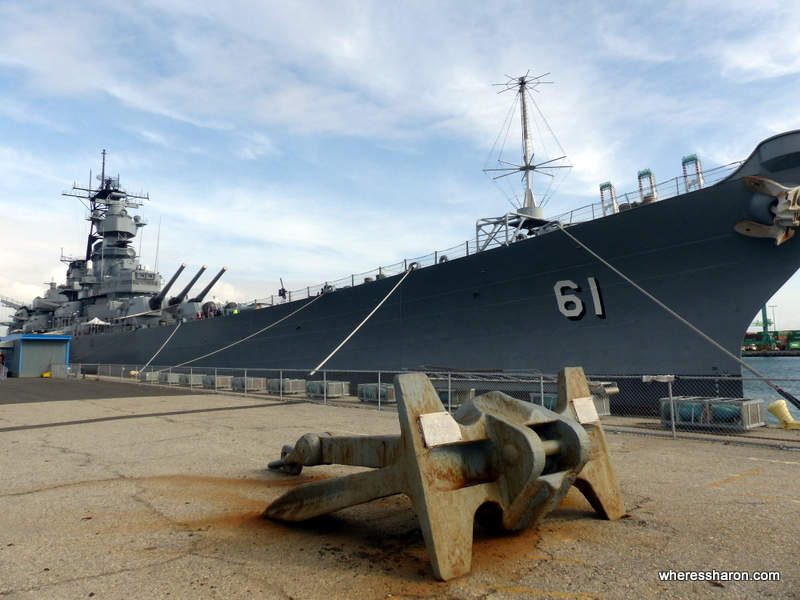 This former battleship is docked at San Pedro, LA and is perfectly set up for a visit. Admission includes a self guided tour which consists of yellow arrows that you follow around the ship visiting various parts from different weapons to different class staterooms/mess halls. There are lots of information boards around as well as many guides that you can ask questions. Our kids loved exploring the ship, as did we. What helps to make it one of the more fun places to take kids in Los Angeles is the fact that they give kids an activity sheet where they have to find pictures of the old ship’s dog, Vicky, around the ship and match it to what area of the ship they found that particular photo. The kids loved looking out for Vicky which made it even more fun. 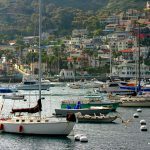 For a very different choice of things to do in Los Angeles with family consider a day (or overnight) trip to Catalina Island. Located only about an hour and a half by boat from Los Angeles, this island is very different. It’s stunningly beautiful and, with 88% of the land owned by the Santa Catalina Island Conservatory, there is limited development. The main town of Avalon is small, pretty and fun to walk around. We particularly enjoyed taking in the pretty views and going on a glass bottom boat tour. 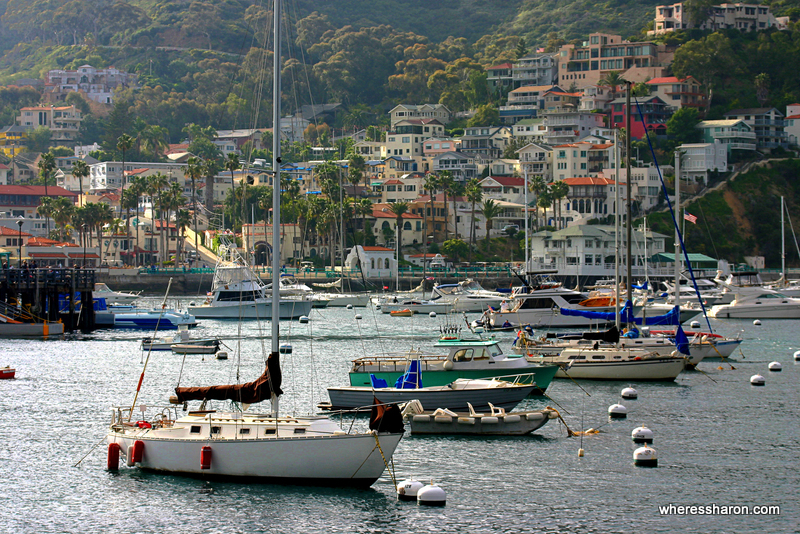 Read our full guide to Catalina Island here. Carnival Waterworks is lots of fun with kids! 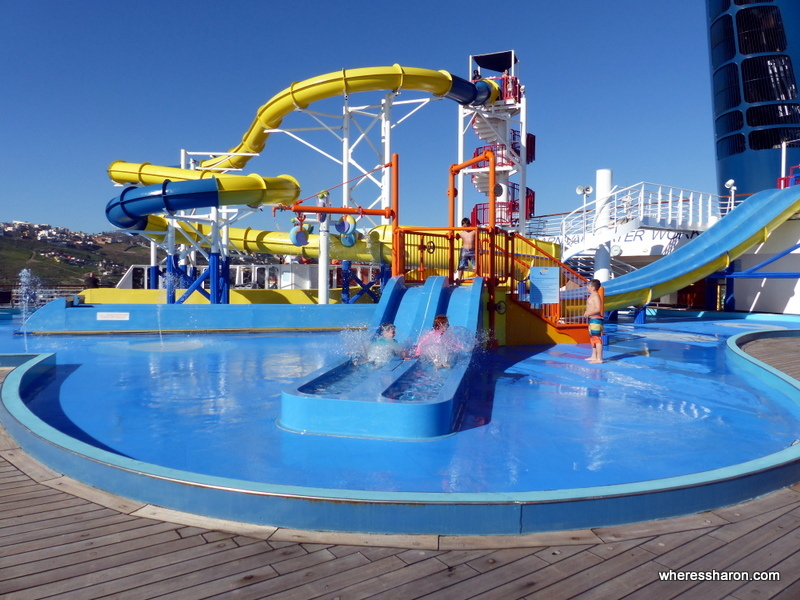 For the ultimate in fun family things to do in Los Angeles, we recommend a Carnival cruise! We just love cruising and it’s easy to do a short cruise from Los Angeles. We went on a 4 day cruise on the Carnival Imagination visiting Catalina Island and Mexico and it was great. Travel is so easy when all your food is supplied and entertainment is surrounding you! The Carnival Imagination is full of fun things to do. You can read more about it in our full review here. Magic Mountain – This theme park is known for all its roller coasters so we are waiting to visit this one of the places to go in LA for kids when our kids are older. 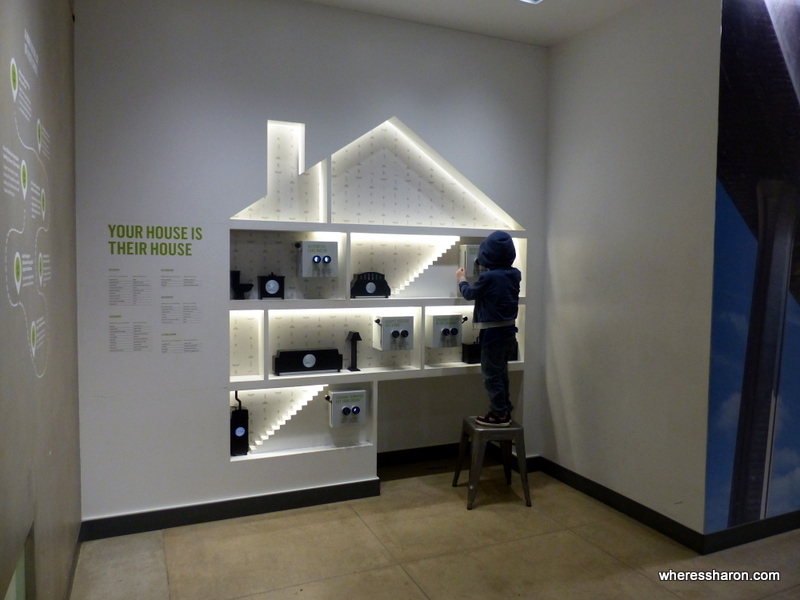 Zimmer Childrens Museum – Our kids’ love children’s museums and we were going to visit here and then our flight was severely delayed and we effectively arrived in Los Angeles a day later and ran out of time. 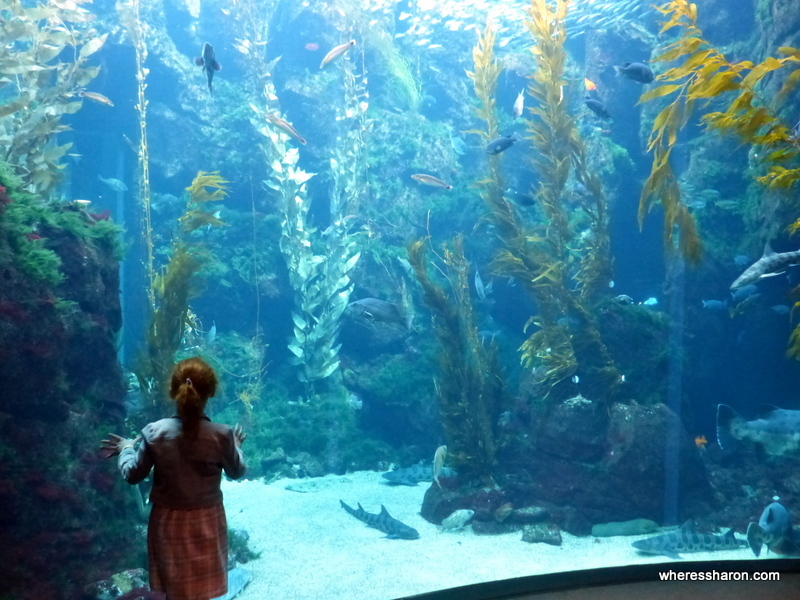 Aquarium of the Pacific – A top Los Angeles attractions for kids in Long Beach. OUE Skyspace – A new observation deck in downtown LA. Many of the kid attractions in Los Angeles are not cheap and they can quickly add up making a trip here as expensive as you want. Accommodation is also pricey in central Los Angeles areas. It doesn’t have to be super expensive though – we kept to our $200 a day budget the first time we visited Los Angeles with kids. Our biggest money saving tip is to purchase a GO card for Los Angeles. This includes many of the LA attractions for families including big ticket ones like Universal Studios or Knotts Berry Farm. You can either buy a pass based on how many days you will be visiting or buy it just for the attractions you want to visit. If you buy it for individual attractions, then you save 20% on the admission cost for each one! You can save even more with the pass based on the number of days. We used a GO card which specified the LA family attractions and a 7 day all inclusive pass for San Diego (which included Knotts Berry Farm). This saved us a ton of money. Click here to see more information about the GO cards and how much money you can save. Another pass worth considering to save cash is the CityPass for Southern California. This includes Disneyland California (a three day pass), SeaWorld San Diego and Legoland California. It is far cheaper than paying for the attractions individually. In fact, the price is not much more than the cost of entry to Disneyland alone. Click here to read more about the CityPass. Los Angeles is a MASSIVE city and I suggest planning what things for kids to do in LA you want to do first before working out where to stay. This is to minimise the driving times between the locations you want to visit. I recommend considering Santa Monica, West Hollywood and Venice Beach. I have been happy staying in all of these areas and found them relatively central to most Los Angeles family attractions. The big exception to this is Disneyland and Knotts Berry Farm. They are both located in Anaheim and I would consider staying in Anaheim as well as Los Angeles for the days when you want to visit these attractions. This will save time and I also found that accommodation in Anaheim was substantially better value than accommodation in central Los Angeles areas. Click here to find all Los Angeles accommodation options. We loved staying in this hotel in the middle of Venice Beach. It’s right on the boardwalk but we couldn’t hear any noise at all in our room at the back. There are a range of room types – we stayed in spacious studio apartment which had a small kitchen area. It was a great price and the staff were very friendly. They also have lots of beach gear that you can borrow for free. If you are looking for a great value option in a spot that can’t be beat then Ocean Luxury Lofts and Suites is a fabulous choice. In advance, their rooms and suites can be very good value -we paid $100. However please note that the name isn’t appropriate, I would not call these luxurious. I also wouldn’t recommend this option for preschoolers as kids running around and noise does travel to neighbouring rooms. There’s no air conditioning and there are live bands in the pub below on weekends. 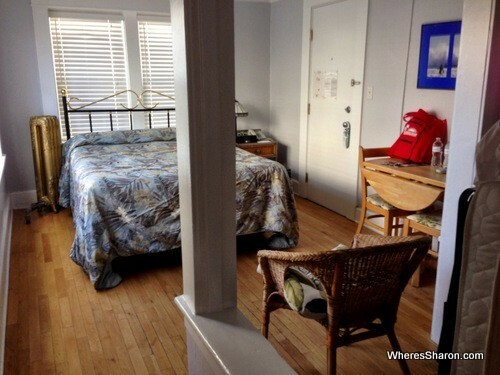 The huge upsides are that you will find nice rooms opposite Santa Monica pier. We also had a good view of this area. 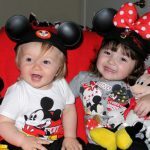 We are so glad that we found this fabulous value accommodation in Anaheim close to Disneyland. For only about US$100 a night, we had a “two bedroom queen suite”. This consisted of one very big hotel style room that had a king size bed, dining table and four chairs, a sofa bed and other couches as well as a kitchenette. There was also a second room with a double bed. The room was a good standard and very quiet and we were so thankful for the extra space compared to an ordinary hotel room especially at this price. There are also other room choices from standard hotel rooms to family suites with bunk beds. Breakfast is included and was decent with eggs, hamburgers, waffles, donuts, cereal, fruit etc. The breakfast room was busy when we visited and we liked the excuse to load up on food to take back to our room to eat. As an extra bonus, we had no problem securing a complimentary late check out to 1pm. My only complaint is that parking is an extra US$15 a day, but even with this factored in, this place is a great price. If you are looking for an easy option before a cruise out of Long Beach, Holiday Inn Downtown Long Beach is a solid option. The hotel is exactly as you would expect. It’s on the old side and our two double bed room was comfortable and small. There were two double beds, a chair and a desk and chair. The hotel offers a free shuttle within 3 miles including to the cruise terminal. We bought a package which included free parking for our car while we were on the cruise. 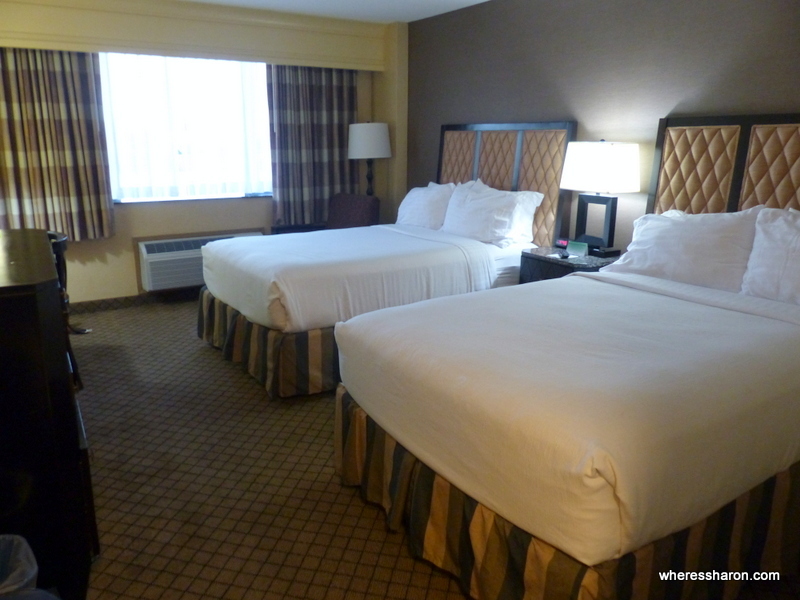 The Comfort Inn Cockatoo is a solid choice if you are looking for a hotel near the airport. 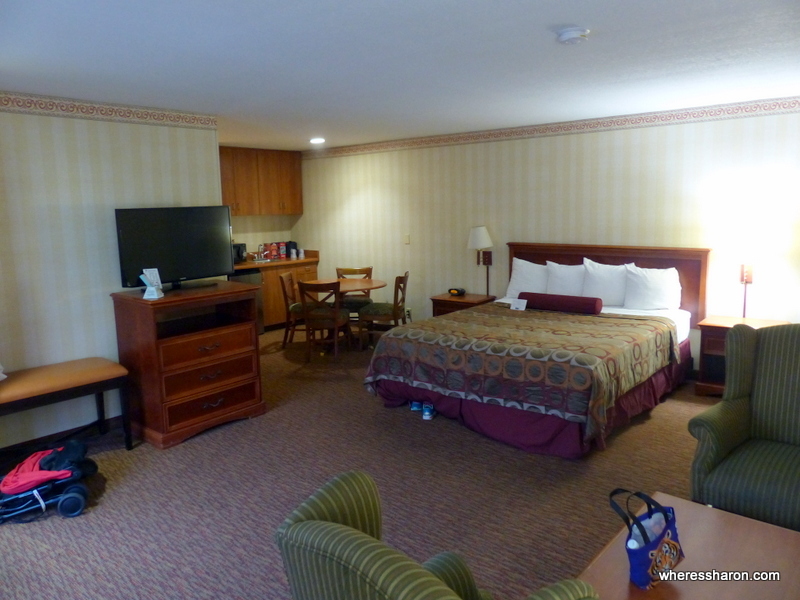 We stayed in a two queen bed room which was comfortable, very spacious and a great price. The room had a kitchenette and the beds are extra comfy. We enjoyed the outside pool. This hotel is a 5 minute drive from the airport. The surrounding neighbourhood is sketchy but it’s fine for a stopover. There’s some shops and eating options a short walk away. We were especially appreciative that the hotel let us check in at 9:30am. Read more options in our full guide to the best family hotels in Los Angeles. We love Los Angeles! There is so much variety and it is such a fabulous city to visit. As an added bonus, there are many fun things for kids in Los Angeles from the famous Disneyland to the very interesting La Brea Tar Pits. Being Australian, Los Angeles is the gateway to the Americas for us and, as such, I have been many times. My only regret is that it often becomes a short stopover on our way to or from elsewhere. This time, we did spend more dedicated time but it still wasn’t enough. It would be easy to spend weeks in Los Angeles. 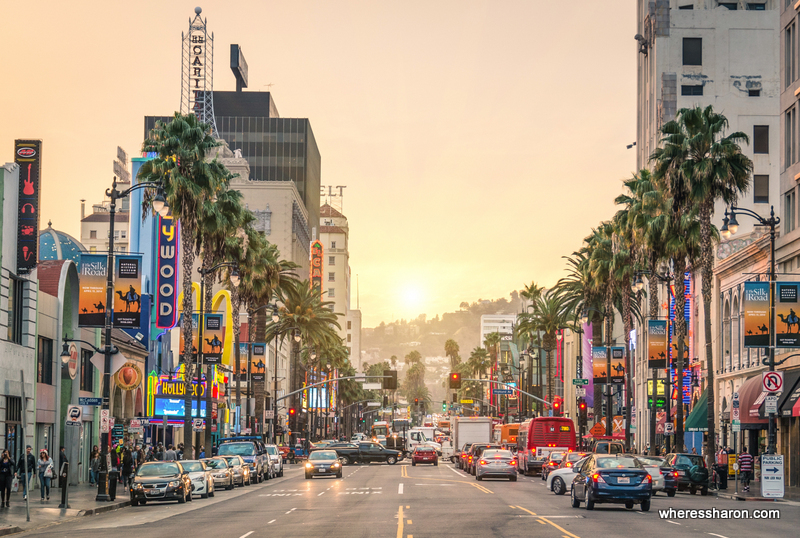 Our favourite places to visit in Los Angeles with kids are the theme parks – Disneyland and Knotts Berry Farm – as well as La Brea Tar Pits, the California Science Center and Santa Monica Pier. Will we back? Most definitely! We love exploring the US! 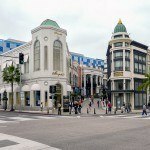 What are your favourite attractions in Los Angeles for families? We visited LA as part of a two week road trip in Southern California. Read all about it here. You can also read our full guides to Orange County and San Diego.